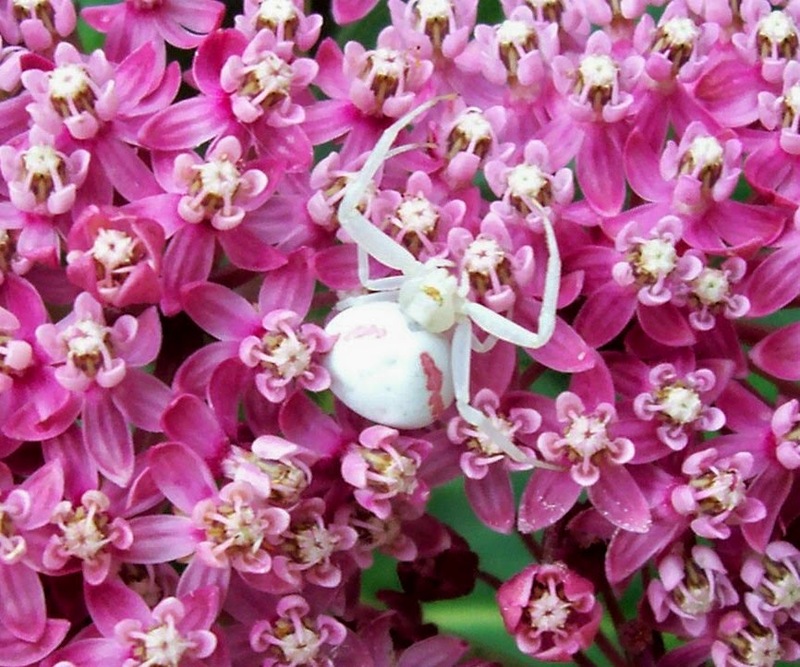 A beautiful pink and white spider! I had never seen a spider like this before, and was amazed at how the pink stripes on her (yes, it is a female) abdomen exactly match the color of the flowers. I could not find this species in any of my nature books, so I googled "pink and white spider" and immediately found this page on a spider website that not only identified the species, it gave me a lot of other interesting info. Turns out my pink and white spider is nothing rare. The species is very widespread and often found on a variety of flowers. There were many, many more sites where people asked or wrote about this interesting spider. 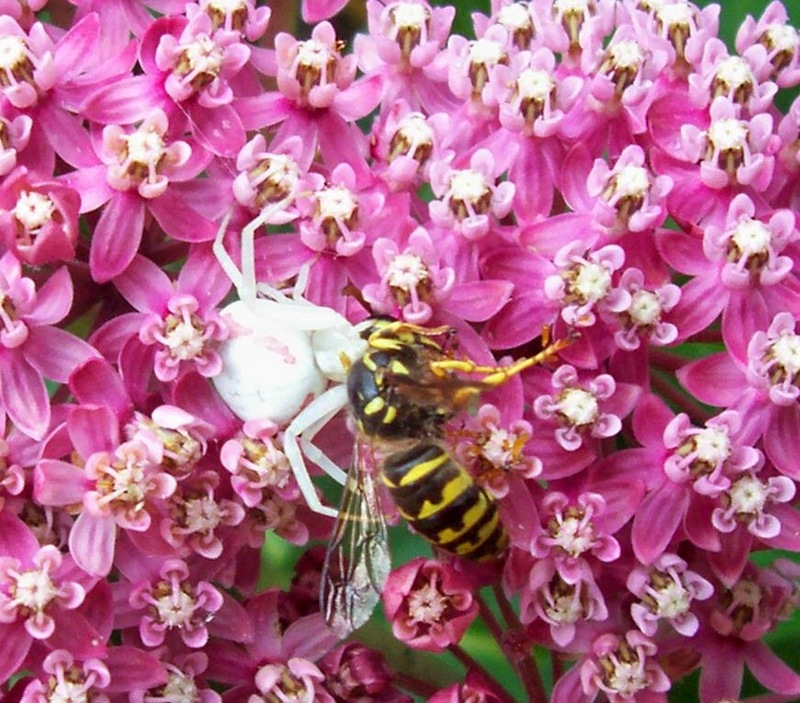 The scientific name is Misumena vatia, and it a variety of crab spider, known as both a Milkweed Flower Crab Spider and a Yellow Goldenrod Crab Spider, among several other names. This is one of the few North American spiders that can change its color to match its surroundings -- an arachnid chameleon! After reading this, I remembered that I had seen similar spiders on goldenrod flowers, but they were yellow. Now I know they are the same species. This is a "wait and pounce" type of spider that does not spin a web. Instead, it sits quietly on flowers, blending in and waiting for something to land. When I checked back a few hours later, the spider was still there and feeding on a yellow jacket wasp that she had caught. Which brings me to another nature observation. This summer, I have not seen a single honeybee anywhere on my land. Not one! As you may already know, the honeybees are facing a serious health crisis and are dying out by the droves. Years ago I used to stand under my apple trees when they were in bloom and hear a constant, busy humming as the bees did their work. But no more. This year, the fruit trees were silent. However, I am still getting pollenation on my flowers and vegetables. 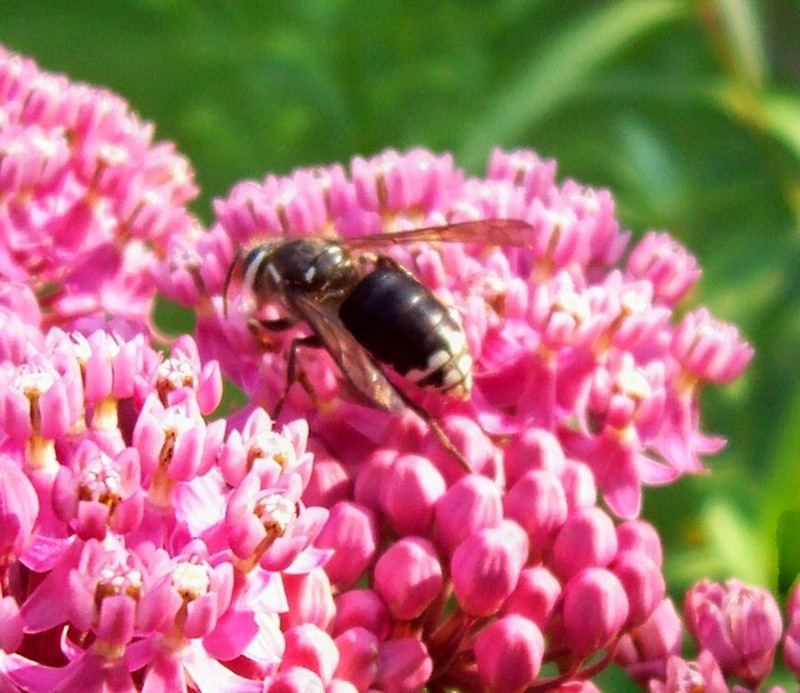 The niche has been taken over by various other insects, including paper wasps, yellow jackets, hornets, flies, moths, butterflies, and a variety of species of bumblebees. This is why I do not remove wasp nests unless they are in a spot where they might be a problem for animals or humans -- such as right over a door way. 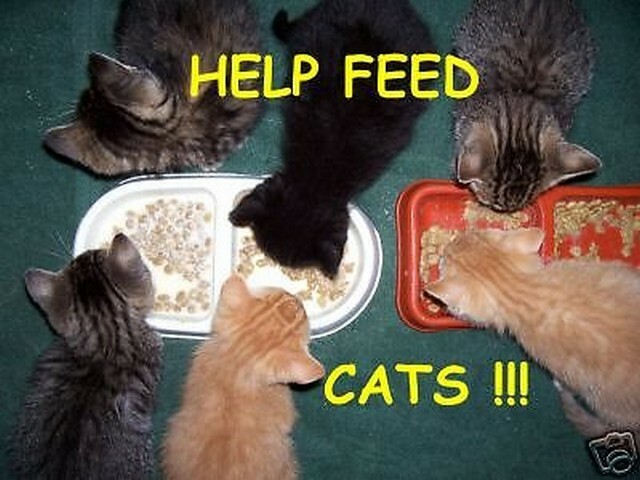 Otherwise, I leave them alone. To those visitors who complain about wasps flying around, I reply that these are the insects responsible for pollenating the vegetables we harvest. Plus they are insect predators, removing a lot of destructive caterpillars from the garden. Really, the wasps and hornets are more beneficial that bothersome -- and if you don't bother them, they won't bother you. Our "ghostly" light bulb mystery is finally solved! My last few blog posts have been rather heavy reading, so I thought I'd lighten up today with this true story. In the past few months, the light over our kitchen sink mysteriously went on and off at all hours of the day and night -- seemingly on its own. Most disturbing was the fact that the light often went off on Shabbos (the Sabbath) -- a time when observant Jews do not turn lights on and off. I would come downstairs in the morning and the light would be off, even though I knew it had been on when I went to bed. Later in the day, it would be back on again. There was no discernible pattern to this, it just seemed to randomly happen. No, there wasn't a short in the wiring or the light socket. No, the bulb wasn't loose. Nor was it defective -- we actually tried replacing it. No effect, the same thing happened. My wife and I each "accused" the other of accidentally turning it on or off, and each of us denied it -- multiple times. I began to wonder if the house was haunted. Either that, or we were both getting very absent-minded in our old age. Then one day, I caught the culprit. The light has a pull cord, and one of our cats had discovered that if he grabbed the little ball at the end and pulled, he could turn the light off -- or on. There he was, plain as day, pulling it multiple times -- on, off, on, off, on, off... and apparently having a great time! As for safeguarding the light on Shabbos, we now loop the string around a nail up high on the wall so he can't reach it. There's no rule against animals turning the light off on Shabbos, but we humans don't want to be left in the dark. During the week, however, we leave the string down -- and at least once a day we catch Tesla pulling it on and off. Then he gives us a look that is almost laughing. Clearly he enjoys the game. UPDATE 3/25/2016: Last summer Tesla disappeared. 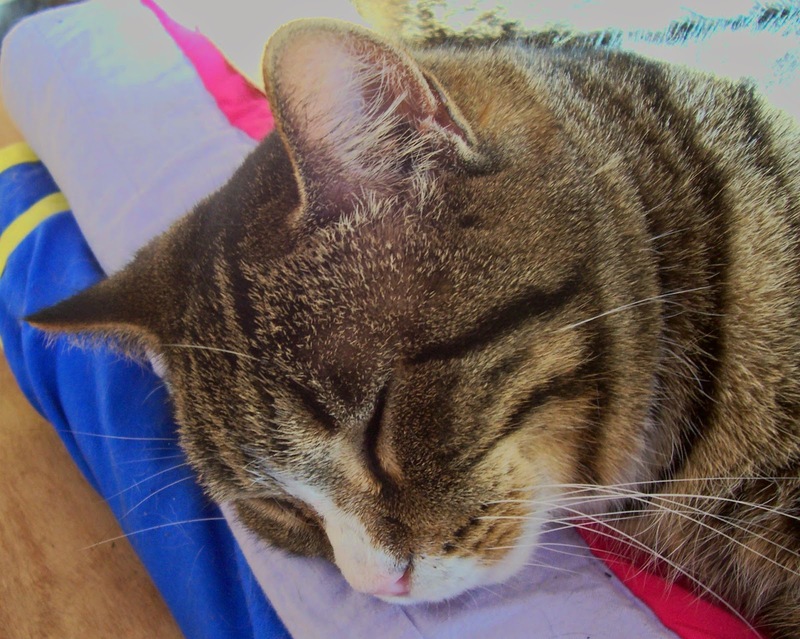 He went outside as usual, but never came home. 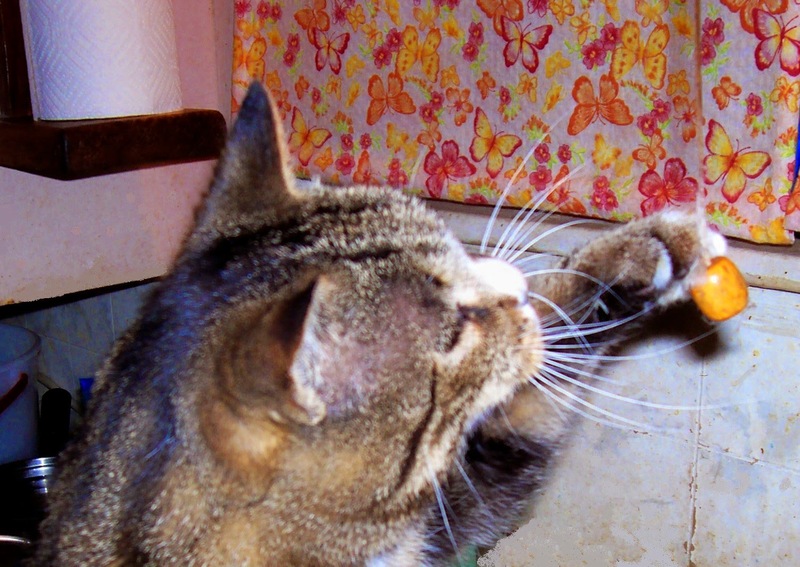 Like so many of the stray cats we took in, he was a wanderer. I hope that wherever he is now, he is happy. Rabbi Zalman Schachter-Shalomi, often hailed as "the father of the Jewish Renewal Movement," passed from this earth on July 3, 2014 (5th of Tammuz 5774). He was radical, controversial, and sometimes a little bit crazy -- but undeniably a brilliant genius who made a tremendous impact on all branches of Judaism. This post is not so much a eulogy as a personal memoir of my experiences with Reb Zalman and how he impacted my life and work. Although I eventually drifted away from the movement he founded, I never forgot all that I learned from him. The name "B'nai Or" originally came from the Dead Sea Scrolls (thought by many to be Essene writings), where the Children of Light battle the Children of Darkness in the Last Days. Those Scrolls were discovered in 1948, right after World War II, when the Nazis had destroyed the Jews of Europe and Hasidic culture was in danger of being lost forever. Reb Zalman was deeply touched by the story of the Essenes retreating to the wilderness at Qumran to preserve their writings and teachings. 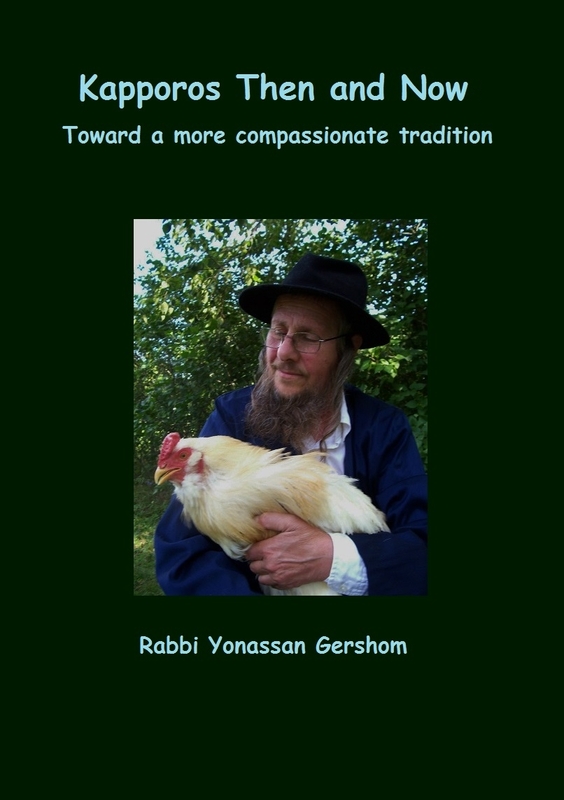 He felt that something similar was needed to preserve the teachings and contemplative techniques of Hasidism as it had been before the Holocaust. He originally envisioned B'nai Or as a semi-monastic Jewish community, a sort of ashram, which he described in a paper called Toward an Order of B'nai Or. It was an idea that I eagerly embraced. In 1982, Caryl and I moved to his center in Philadelphia with the intention of becoming part it. For almost a year we lived in the old B'nai Or House on Emlen street, where we had daily contact with Reb Zalman (his family lived upstairs) and I sometimes got to travel with him. it was during this time that I presented my first workshop on "Jewish Tribal Consciousness" (discussing parallels with Native American culture) and wrote the first version of my book 49 Gates of Light while walking daily in nearby Fairmount Park. 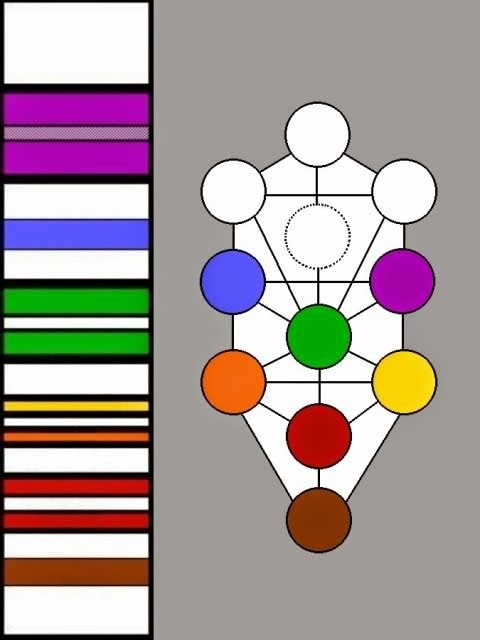 At the annual B'nai Or retreat at Fellowship House Farm, I presented my model for integrating the chakras with the sephirot on the Kabbalah Tree of Life, upon which 49 Gates of Light is based. It was also in Philly that I started hearing that Judaism had reincarnation teachings, which set me on the road to eventually writing Beyond the Ashes: Cases of Reincarnation from the Holocaust, the book for which I am best known. In all of this, Reb Zalman was always very supportive. I was only at B'nai Or House for a year, but it was a year that impacted the rest of my life. Without his encouragement, my books might never have been written. The old B'nai Or was much more orthodox than the Jewish Renewal movement of today. It was closer to what is now called Traditional Judaism (or Conservadox) except that it had a more mystical bent to it. It has also been called neo-Hasidic and I think the term fits well, although I cringe at the sound of neo-anything. But Reb Zalman did manage to be a bridge between the Hasidic philosophy and practice of the Old World and the post-Holocaust Judaism of today. Hasidim before the Holocaust --even in Chabad, where Reb Zalman was ordained -- was much more contemplative than it is now. The semi-monastic community that Reb Zalman envisioned never materialized, but his teachings did spread through workshops and "spiritual labs" where we would explore our inner feelings about God and Torah. At the time I was in Philly, B'nai Or was not so much a movement or a denomination as a spiritual path in terms of daily discipline. Nor was it so political as Jewish Renewal of today. Jews of all backgrounds came, experienced, and then took that energy back home to their own communities. "Bring it all home to davening (Jewish worship), Reb Zalman would say. "Bring it all home to davening." There were a lot of experiential exercises that we tried during the week in his "spiritual labs," then we brought the insight and energy of that experience into the traditional liturgy. Reb Zalman also taught a method of chanting the prayers in English, but using the traditional tunes and cadences, in order to make the davening more accessible to people who did not know Hebrew. All of this was very helpful in opening up the texts to a living tradition. I have continued to use some of these techniques in my own classes and workshops. But somewhere along the line, in the transition from "B'nai Or" to "Jewish Renewal," the lab experiments became the davening itself, which was just too strange for me. For example, Reb Zalman began to teach a technique where two people recited the Shema while staring deeply into each others' eyes. This I could not do -- and I know now it is because I am autistic. (I have Asperger's, which was undiagnosed at the time.) Eye contact in general is difficult for autistic people, and staring into somebody' eyes is extremely uncomfortable. Doing that makes me feel like we are two roosters squaring off for a fight -- exactly the opposite of the "trust" it was supposed to build. For similar reasons, I could never really "get into" some of the other exercises where we davened in "twosies" and "threesies." The more we moved into this sort of partnered davening, the more I retreated into myself. This was not about "refusing to be open" as some people misinterpreted my reluctance to participate. It was about the fact that my brain functions very differently from "normal" people. What is inspiring to others is not always that for me. Had I known about my autism back then, I might have approached things very differently. And others, in turn, might have had a better understanding of my lack of social skills and quirky personality traits. But as it was, I became increasingly alienated from the people and the movement, although never from Reb Zalman himself. He always accepted me for who I was. From "B'nai Or" to "P'nai Or" to "Jewish Renewal"
In 1983, Caryl and I returned to Minneapolis. When I went back to Pennsylvania in 1985 to attend the first national Kallah gathering in Radnor, PA, much had changed. Political correctness had arrived, and the feminists objected to the word "B'nai" because it literally means "sons." So "B'nai Or" became "P'nai Or" ("Faces of Light"). Current biographies describe Reb Zalman as having "founded P'nai Or in 1962" but that is revisionism. B'NAI Or was founded in '62. The name change did not take place until 1985. I was there when it happened. "B'nai" does literally mean "sons" but it also means "disciples," and I have always felt that this was more than just a name change. Over the years, the energy has shifted away from a focus on discipleship toward one of humanism. Eventually the B'nai-P'nai name was dropped entirely, and the organization became "The Aleph Alliance for Jewish Renewal" as it is called today. The 1985 Kallah was the last event even billed as "B'nai Or," and the last I ever attended. I was ordained by Reb Zalman in 1986, and for a while I remained connected to his work. But as things became less and less comfortable for me, I went my own way, eventually to become a Breslov Hasid. This was something Reb Zalman had apparently foreseen, because in 1983 he referred to me as "a master of prayer in the way of of Nachman of Breslov." When I asked him what he meant by that, he said he saw me as someone davening alone in the forest, like the "Master of Prayer" in the Breslov story. (Rebbe Nachman taught his followers to go alone to a field or forest and pour out their hearts to God.) Which, now that my wife and I live in rural Minnesota, is exactly what I have become. Not a congregational rabbi, but a reclusive "Jewish Thoreau" who writes about Judaism and nature. Although I broke with Jewish Renewal as a movement, Reb Zalman and I remained in touch behind the scenes. I always sent him my latest books, and he was always supportive. I, in turn, supported his work, sometimes giving feedback on current projects. I remember especially a conversation we had back in 1982 about how, in tribal cultures, people don't try to remain eternally young. In Native American tribes, people accept the stages of life and transition into being elders. Grey hairs become a mark of wisdom and honor, not something to hide in shame. I do not know if this conversation eventually influenced his workshops on "eldering," but I do know we both shared a lot as we aged. 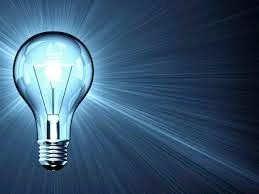 Reb Zalman was always open to new ideas and truly followed the line in Pirkei Avot: "Who is wise? He who learns from all people." And many, many people have learned from him, even if they do not realize it. When I brought my 49 Gates of Light book back into print for its 4th edition, I included the story of the B'nai Or rainbow tallis (prayer shawl) so that story would not be lost. After all, the book itself is based on his design and how it integrates with the sefirot (see diagram). Back in 1982 he had explained this to me in an interview, which I then wrote up and published in the old B'nai Or Newsletter. Newsletters get lost, however, and I wanted the story to be told to a wider audience. Many people do not realize that he was the first Jew in modern times to make a tallis in colors other than black or blue and white. At the time it was so radical, he was unable to find a tallis weaver willing to make them, and had to go to a non-Jewish vestment company instead. He never copyrighted his design, so now everyone is making them, but he did it first back in the 1950s. Today the idea of a multi-colored tallis has entered popular culture and is taken for granted. So much so, that someone once walked up to the aging Reb Zalman and asked, "Where did you get your rainbow tallis? Yours is exactly like mine!" I could go on forever, but this essay is already getting too long. 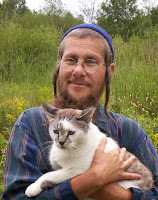 Reb Zalman was way ahead of his time, and always a loving, caring, compassionate teacher. He impacted my life forever, and I will deeply miss him. Portions of this post were adapted from my longer essay, "What B'nai Or Was Like in the Old Days," included in the fourth edition of 49 Gates of light: A Course in Kabbalah. On the Death Of Rabbi Zalman Schachter-Shalomi by Rabbi Michael Lerner. Personal memoir. 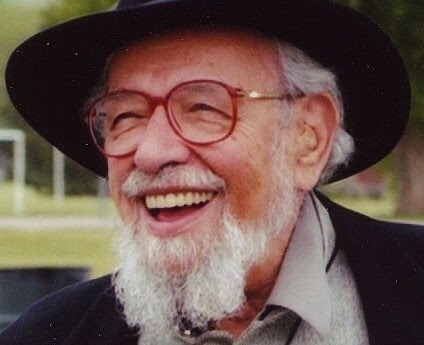 Rabbi Zalman Schachter-Shalomi, Father of Jewish Renewal, Dies at 89 -- Huffington Post. Excellent biographical review of his life and career.